Last week Dietmar Aust tweeted about the APEX 18.1 ability to generate Swagger Doc from your ORDS based RESTful services. This is actually an innate ability within ORDS itself and is simply exposed through APEX. What may not have been obvious in EA2 was that there is also a new Instance setting under the REST section. The new setting takes a URL which points to a SWAGGER UI 2.0+ server. If the instance setting is set, the URL that generates the web service’s swagger JSON document will be passed to the Swagger UI server. If a there is no URL specified, raw JSON will be produced. Then, when you’re in the ORDS REST Workshop, navigate to the module definition level and click the Generate Swagger Doc button. 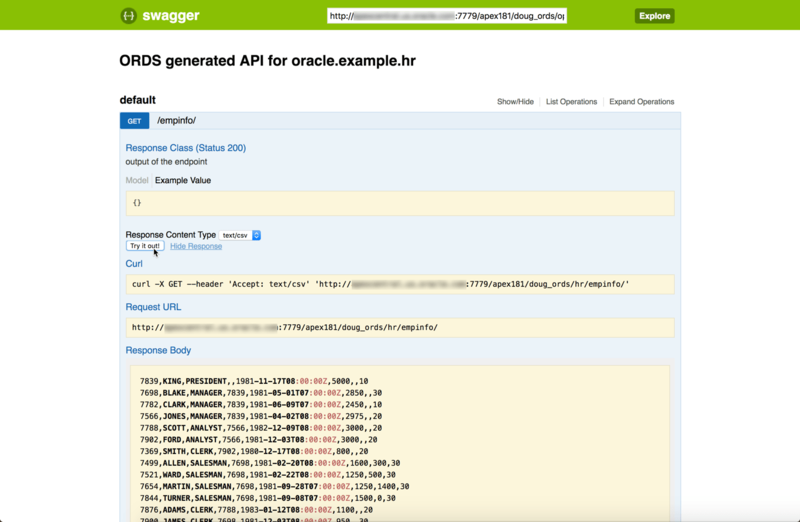 If the Swagger UI URL is set correctly at the Instance level, APEX will forward the URL of your documentation to the Swagger UI Server. The server must be able to reach back to the documentation url, but as long as it can, you’ll not only get documentation but be able to test the services as well. Hope this helps Dietmar in his APEXWorld2108 presentation! This is for the cloud? Is it possible to install a standalone instance of Apex? You are probably aware that Oracle APEX is a Low Code development environment that runs inside the Oracle database. Therefore the answer to your question, “Is it possible to install a stand alone version of APEX?” is not a simple yes or no. 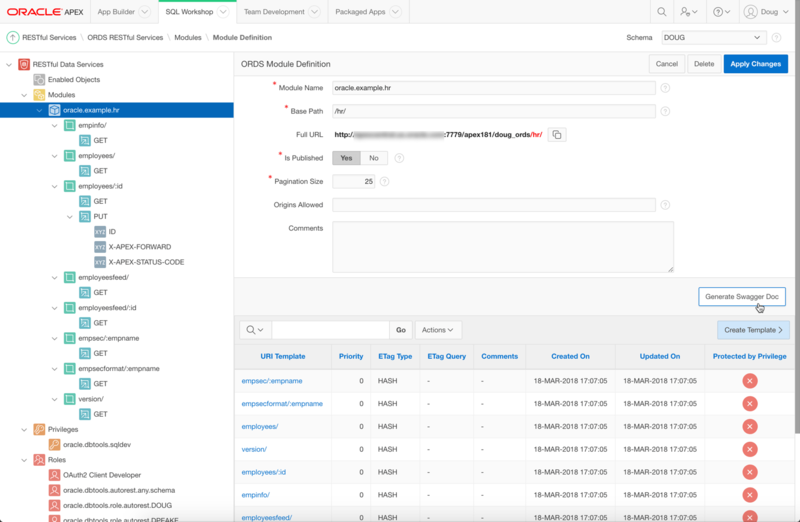 Since both the APEX development and runtime environments live inside the Oracle database, you obviously have to have an Oracle database available. The good new is that APEX will run in all versions of Oracle including the free version, Oracle XE. Therefor you can stand up a “stand alone” environment using Oracle XE on your local system, a Virtual Machine, a Docker Image or wherever you’d like.